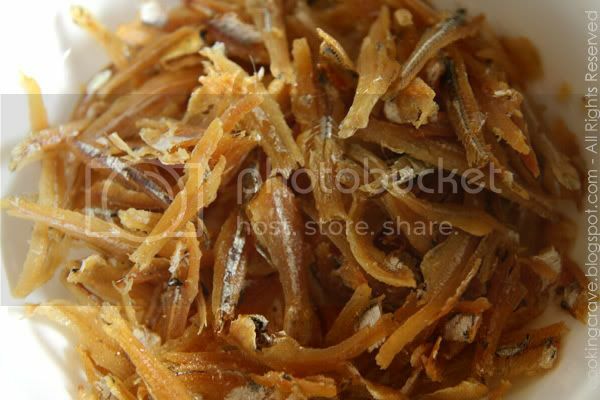 Cooking Crave™: Deep Fried Anchovies - "Ikan Bilis"
Anchovies - "Ikan Bilis" are little silver, salt-water fish that is versatile in cooking. We bought from wet market and supermarkets. It's dried, preserved in salt and we then deep fried at home. It is commonly seen served with Nasi Lemak. There are just so many ways you can use it - stir-fry it with sambal, add to soups for that extra sweetness & flavour, stir-fry with vegetables or just toss in the salads for the crunchy feel. We also can eat it just like that as snack. Remove it's head, bones and wash the anchovies. Repeat till the water is clean, drain water and let it dry under the sun (so that there is no more moisture & the oil won’t splat, splat, splutter when you’re deep frying them later on). Then deep fry in medium high heat for about 5 minutes, or until they are golden brown & crispy. Remove from oil and wait the anchovies to cool before store it in an airtight container. We can keep the left over Ikan Bilis in the fridge and it can be kept up to 2 weeks. Click HERE to read more about "Ikan Bilis".